What Is Concha Bullosa and How Is It Diagnosed? Have you ever heard the phrase, "breathe in through your nose and out through your mouth?" This phrase is actually based on science. When you breathe in through your nose, many things happen including humidification of the air. Humidification occurs as the air travels across 3 to 4 conchae. The conchae were formerly called turbinates. The conchae are shell-shaped bony structures on the opposite side your nasal septum, which separates the left and right sides of your nose. Many tiny blood vessels within a mucus membrane cover the conchae. The lowest concha, or inferior concha, is an independent bony structure, while the middle and upper (superior) concha are actually part of the large ethmoid bone. These conchae form three nasal passages for air to flow through. Each of these passageways, that are separated by conchae, have openings to your sinus cavities. Between the lower concha and the bottom of the nasal cavity is the nasolacrimal duct, or tear duct. In the middle passageway is the opening to both the maxillary and frontal sinuses. While the upper passageway has the opening to the sphenoidal sinus. Concha bullosa is also known as pneumatization of the middle turbinate. This just means that there is an air pocket in the middle concha. Concha bullosa is a very common anatomical deviation that does not always result in you having sinus problems. However, enlarged turbinates and concha bullosa may cause a blockage which can prevent your sinuses from draining properly. 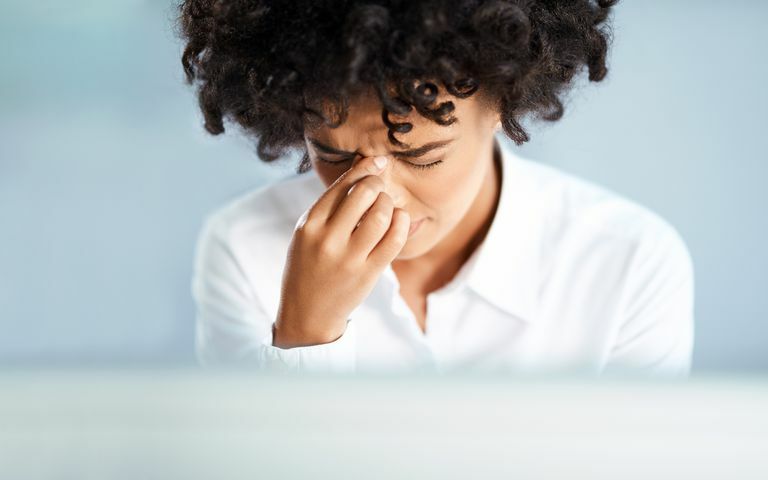 Sinuses without adequate drainage can result in frequent sinus infections. Concha bullosa may also predispose you to having a deviated septum. Concha bullosa is best diagnosed with a CT scan and is estimated to be found in 16 to 53 out of 100 cases. The turbinates will normally show up as a light gray color, however, in the case of concha bullosa, there will be a black pocket of air in the middle of the gray turbinates. The views of the scan will also allow your physician to determine if the concha bullosa only occurs on one side of the nose or both sides. Your doctor will also be able to determine from the CT scan whether or not you have a deviated septum. Most of the time, concha bullosa symptoms are not severe enough to require treatment. However, if treatment is necessary, surgery is the only option to eliminate the air pocket. The three surgical methods include: crushing, resection, and turbinoplasty. Crushing is a commonly used method to treat concha bullosa. This is done under general anesthesia with an endoscope. Your physician will inject your concha with epinephrine to vasoconstrict, or make the blood vessels smaller. This will help to limit any inflammation and reduce bleeding. If sinus surgery is also needed, the sinuses will be operated on first. Once the sinus surgery is complete, forceps will be used to squeeze the concha bullosa from top to bottom and then squeezed toward the back to minimize damage to the turbinate. The crushing method has a very successful rate with minimal complications, though bleeding after the operation is possible. Crushing also carries the least risk for affecting your sense of smell. Turbinate resection is the surgical removal of part of the concha or the complete removal of the concha. This allows for improved airflow and removes the concha bullosa. The remaining tissue is then cauterized and nasal packing inserted to reduce bleeding. Turbinoplasty involves cutting open the turbinate and removing tissue and a small amount of bone. Once the tissue is sufficiently removed the incision is closed.